The wait was long, but in the end it proved to be worth it. Gamers' Gauntlet II was by far the smoothest and most successful party we've hosted yet. Problems with power and the network were few if at all and everyone seemed to have a blast playing and socializing. Setup went without a hitch. First we pulled the "Alien" like power cables out of the ceiling and hooked them up to our "Beast" of a power box that gives us our nice clean power for all the client PC's and servers to use. We then set up all the tables and ran the network and power cables. 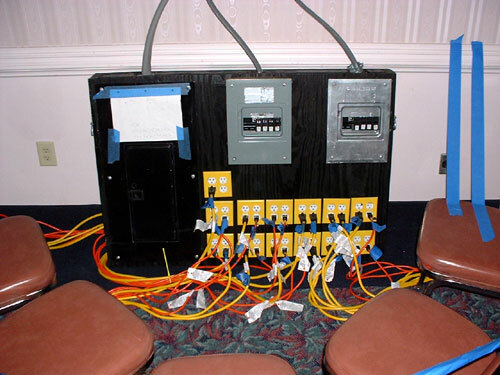 Next, we put out the Ethernet switches and power strips, zip-tied and taped everything down and put the chairs and table covers on. Lastly, we flipped on the power box, iced the sodas and juiced the servers up. Shake-n-bake LAN...G2 style! 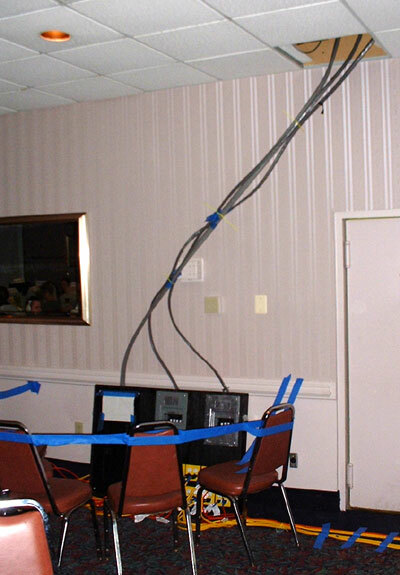 New for this party, we ran the entire room with high quality CAT-6 cabling. This gave us a more rugged network that supports much higher transfer speeds as CAT-6 conducts a cleaner signal. It seems the more events we hold, the more familiar people are with the routine of getting connected to the G2 network. Almost everyone got connected quickly with only a few problems here and there. Opening registration moved at a quick pace, something our registration staff strive for. They know everyone wants to get in and onLANline as quickly as possible. New this time were some smooth lanyards ordered and designed by smeg. Thanks to nekachu for helping with registration on Friday night even though she couldn't attend the whole event. There was much gaming to be had throughout the party. Eight formal tournaments and many pickup and match servers were available all weekend. RTCW was quite popular and the Sega Dreamcast definitely got some action in. Serious Sam also had some massive co-op games running. Lots of scrims and pickups were had and many people got into a new game or two after watching others play. Tournament time! Both the CS and Q3CTF tournaments started early in the afternoon and ran till about 9pm. We tried a new approach to scheduling by having not only the tournaments start and finish on the same day, but also having both of the day's tournaments run at the same time. Participation in one tournament excluded you from the other tournament. This new system helped to speed up game play and no matches were delayed because of the other tournament. After the first couple of rounds, we had some Fun Tournaments running for those that had finished the main tournaments early. Once our primary tournaments had finished, we had an impromptu Q3CTF Insta-gib tournament on the recommendation from Md-solo with random teams in single elimination. This was a huge success and will probably make it to the next G2. Thanks to solo for his suggestion! For the Counter Strike tourney, Sec.8 retained control of the top spot(s) with both of Sec.8 teams making the finals. DV placed third in CS. For the Quake3 CTF tourney, Killers Inc beat out Massive Destruction in what turned out to be a best of three. Elements of Destruction took third place. Sunday's tournaments were the Quake3 1v1 and Worms World Party. The Quake3 1v1 tourney had Md-Bison beating out KI|Lukin by one in the final game of three to win in overtime. LouZiffer took first place in the Worms World Party tournament with Quintin Stone coming in close second. After this party we instigated a new G2 rule of "No tourneys before 11am" so that we can get as many people in (read up and awake) the tournaments as possible. This is in no particular order but the staff would like to thank the following people. The staff at the Best Western, everyone that helped set up and tear down, Flav for taking all of the pictures, pro for the Geforce2 prize, lunk and SirJev for the LCD projectors, everyone that came who made this one of the best parties ever and all of the G2 staff for all of the countless hours put into making this event possible.